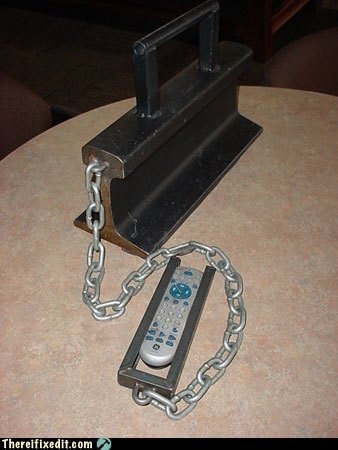 If you’ve misplaced your TV’s remote control one too many times, then I might suggest firmly attaching it to a gigantic anvil-like object via an unnecessarily thick length of chain. Think your little toddler will run off and hide it in his playpen now? No sir. If he’s even able to move the anvil at all, it’ll fall onto the floor or his foot which will either scare him or seriously incapacitate him. Whatever the case, your remote control will remain within arm’s reach of your tattered La-Z-Boy. I’m not quite sure how much you’d have to spend on an anvil, the chain, and the closure surrounding the remote control but can you really put a price on the peace of mind that’s afforded by always knowing that your remote control will be exactly where you left it?